A day around Adelaide resulted in up to 8 lifers for the participants. Flocks of Yellow-tailed Black Cockatoos were seen soaring overhead and we discovered a Tawny Frogmouth on a nest with a chick. Further east, Shy Heathwren, Southern Scrub-robin and Purple-gaped Honeyeater did not disappoint, while a raptor lookout over the Murray river yielded 8 species of raptor including the rare Black Falcon! Back in Adelaide, the day ended with Barbary Dove and Black-faced Cormorants. An early departure heading north and great views of Slender-billed Thornbill were had by all, while Spotted Harrier was seen foraging over the wheatfields. A hurricane-strength storm-front was approaching but we managed to stay ahead of it for the morning. It caught up with us at the Arid Lands Botanical Gardens in Pt Augusta and for the next few hours we were driving through severe thunderstorms, extreme wind and torrential downpours. While this provided fascinating views of rainbows and sunrays in between downpours of the Flinders Ranges, it wasn’t good for birding. During a dry spell at an outback lake we had good views of 50 Blue-billed Ducks, then we arrived to find no electricity at our accommodation in Lyndhurst – as it turned out, the entire state of South Australia was without electricity after being hammered by a hurricane! Very Strong winds bothered us all day but thanks to the local knowledge of our leaders we managed to get some excellent birds. Highlights included nesting Black-breasted Buzzard and Little Eagle; close-up views of White-winged Triller, White-winged Fairy-wren and even one Thick-billed Grasswren, while parrots didn’t disappoint with Mulga Parrot, Elegant Parrot and nesting Budgerigars . The day ended on a high with an Inland Dotterel just after sunset! An amazing morning around Lyndhurst despite relentless winds. Rufous Fieldwren, flocks of Budgerigars, Chirruping Wedgebills and a Thick-billed Grasswren, this one at our feet in a bush! A sumptuous bush-tucker lunch was had in the Prairie Pub. The Flinders Ranges were fantastic after all the rain, with abundant wildflowers and flowing streams. Elegant Parrots provided good views there as did Inland Thornbills and the beautiful Red-capped Robin. A morning walk amongst the breathtaking scenery of the Flinders Ranges resulted in Black-eared Cuckoo, Redthroat, 3 spp of Thornbill, Southern Scrubrobin and Inland Thornbill. 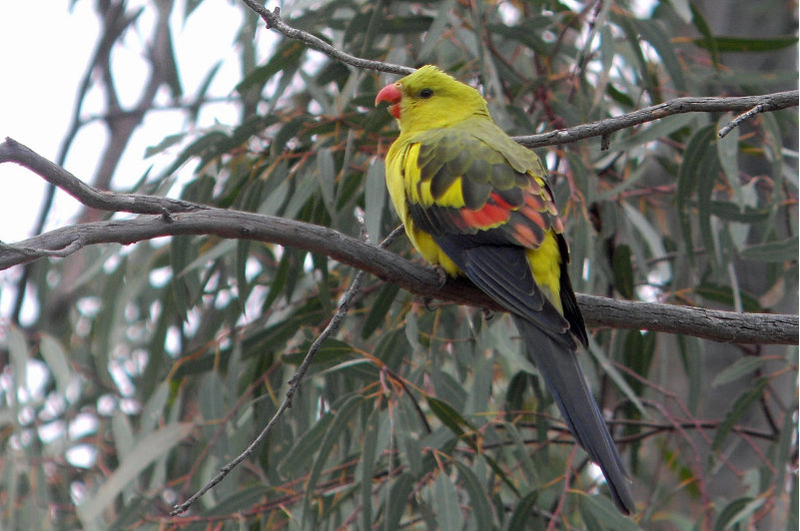 Then we drove through (sometimes flooded) agricultural lands (Brown & Rufous Songlarks) to end up at the Murray river with its ubiquitous Yellow Rosellas and various waterbirds. More flooding! The bird sanctuary of Gluepot was inaccessible but again thanks to the local knowledge of our guides we birded adjacent areas with similar habitats. Good species seen for the morning included Chestnut Quail-thrush, Hooded Robin, Gilbert’s Whistler, Striped and White-eared Honeyeater, Horsfield’s Bronze and Pallid Cuckoo and Collared Sparrowhawk. The afternoon was spent around the Murray river and its myriad of wetland yielding Banded Stilt, Red-necked Avocet, White-headed Stilt and Freckled Duck. The morning of the last day we had excellent views of the increasingly rare Regent Parrot in one of their few remaining breeding colonies. A nearby bush reserve provided good views of Chestnut-crowned Babbler, Southern Whiteface and Blue Bonnet. A cute Owlet-Nightjar was seen at its daytime roost while the wetlands where crakes were normally abundant had been transformed into a raging torrent with trees lying across the path. The day (and the tour) finished with a Tawny Frogmouth on its nest with a chick.